Banner photo courtesy of PHMC taken at Old Economy Village, a site on the Pennsylvania Trails of History. FREDRICK C. POWELL founded and is CEO of OMNI Interactive Systems which custom designs and installs electronic systems for homes and businesses. He graduated from Alfred University, with a Bachelor’s in Business and later received his Master’s from Cornell University’s School of Business and Public Administration. In 1987, Fred founded and served as CEO of Rehab Systems Company (RSC), which built and operated rehabilitation hospitals across the U.S. Following sale of his company he served as a consultant to Novacare and HealthSouth, Inc. His earlier experience included CEO and COO of regional hospitals in NY and PA, as administrator of Cornell University Health Services, and EVP of a public healthcare company. He served, on active duty, as a Regular Army Officer for 5 years, commanding units in the XVIII Airborne Corps and the 3 rd Armored Division. 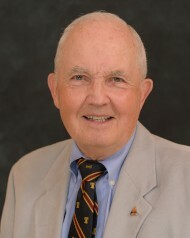 Fred currently serves on the governing boards of: Alfred University, NY (Life Trustee); Ionia, Inc., Vienna, VA; Salt ‘n Light Youth Ministries, Inc., Camp Hill, PA; Wesley Theological Seminary (emeritus), Washington, DC; and the Pennsylvania Historical and Museum Commission. He has previously served on the boards of several public companies; on the faculty of Cornell University for 4 ½ years, and continues to serve in leadership positions in the Central PA Conference of the United Methodist Church. Weidner, and Donald Powell, and 8 grandchildren.